Why do You need a Pre-Filter? Outerwears Pre-Filters are designed to keep out larger particles of street debris such as rubber, dirt, and sand from getting into and clogging the pleats of air filter elements. Premature clogging of an air filter will result in loss of horsepower and an increase in service intervals. Outerwears pre-filters are uniquely designed to protect your engine and the performance air filter investment without sacrificing airflow or horsepower. Particles as small as .005" are filtered out extending filter life. Even in harsh conditions including heavy moisture, an Outerwears Pre-filter will enhance your filter's ability to continue flowing the necessary air required for maximum performance while reducing the possibility of water ingestion into the engine. Proper use of an Outerwears Pre-filter will save money on filter cleanings or replacements and extend engine life. Customers are reporting increased fuel efficiency. 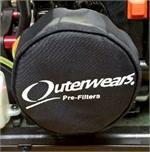 Outerwears Pre-filters are used and recommended by top professional engine builders and race teams worldwide. Outerwears Pre-Filters will help prevent needless engine wear and tear, which will be obvious upon engine analysis during rebuilding.